There are only 5 days left until Christmas, but it’s not too late to create some last-minute holiday decor! I was looking around my living room the other day and noticed an inexcusable lack of sparkle. When it comes to decorating, I like an understated look. Neutrals. Just a splash of color here and there, nothing too wild. But when the holidays roll around, I’ll admit I’m a sucker for sparkles. First, get together your supplies: I had gotten a wooden plaque and little wooden letters at Michaels a few months back. I figured since I already had this plaque left over I should use it up! I had some parchment-colored paint leftover from my DIY Initial Art project, so all I needed was something that sparkled. I decided to try out Martha Stewart’s glitter paint because I didn’t want to deal with the mess that is traditional glitter, especially when the glitter flakes are bound to flake off onto everything and everyone. I know you can use a coat of Mod Podge or the like to keep that from happening, but I didn’t have any and didn’t want to spend much on the project since I already had most of the supplies. Martha Stewart to the rescue! Next, paint your plaque and your letters with a couple coats of the parchment-colored paint. I recommend painting the letters with the same color of paint as your plaque so the wood color of the letters doesn’t show through the glitter. Then, glitter up your letters! Unfortunately, the glitter paint wasn’t as glitter dense as I had hoped–although in retrospect I realize the paint wouldn’t really be paint-like if it were mostly glitter like I originally expected. However, you can still easily create a glitter-dense look with a thick application of the paint and a few coats of it. From here, all that’s left to do is arrange your letters on the plaque and glue them with a hot glue gun, pressing down firmly. You can affix a hook to the back of the plaque to hang it, or you can use one of those mini canvas easel things to prop it up, which is the method I chose to display it on my sofa table. I hope you enjoyed this understated holiday decor tutorial! 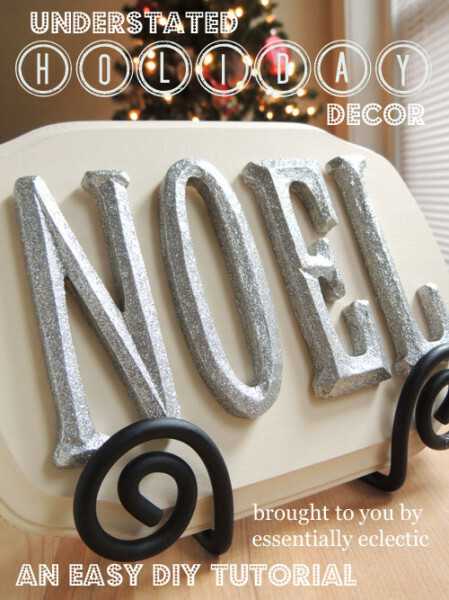 I would love to see some of your DIY holiday decor, so feel free to leave a link in a comment!